Students across the nation have completed the college application process, successfully submitted their FAFSA, and are now in a holding pattern as they wait to see what the financial aid package will be from the schools that they intently hope to attend this coming fall semester. Here is a great video that highlights what these financial aid awards may look like. 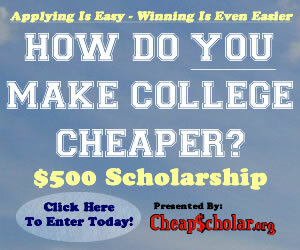 In addition, feel free to visit CheapScholar’s resource for deciphering financial aid packages. The FAFSA (Free Application For Federal Student Aid) is the gateway to all things good when it comes to making college affordable. The downside is that the FAFSA is feared by many, especially those that have never completed the process. This uncomfortable unknown factor is what keeps people from giving it a try and finding out what treasures it will unlock to enable them to obtain their educational goals. On a side note… check out this humorous article comparing the FAFSA to a colonoscopy. If you graduated from college this last Spring, chances are you will be getting some loan repayment notifications in the mail if you have not already. Most student loan programs require students to start making payments 6 months after graduation. The hope is that you have put your new education to good use and are now gainfully employed and better prepared to start making payments on your college loans.